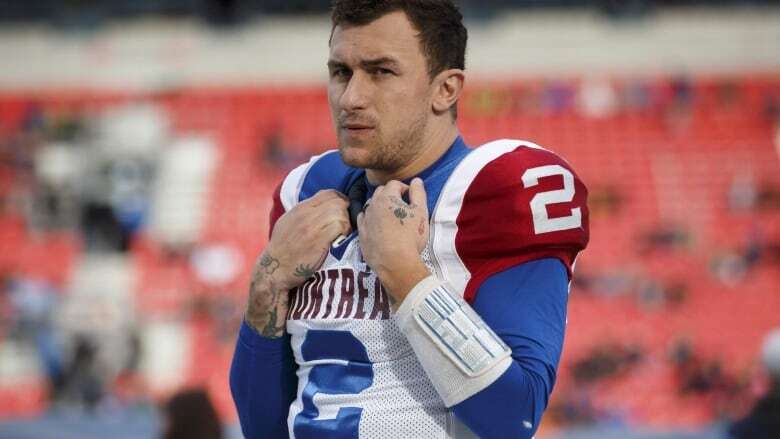 The Montreal Alouettes have released quarterback Johnny Manziel. The team said in a news release it was told by the CFL to terminate Manziel's contract "after it was found that he had contravened the agreement which made him eligible to play in the league." If Manziel wants to continue playing football, one option could be Alliance of American Football, which kicked off its inaugural season earlier this month. And Manziel said he was intrigued by the prospect of playing in either the AAF or Xtreme Football League, which begins operation next year. In December 2017, Ambrosie announced the league would approve a contract for the former Cleveland Browns first-round pick, who at the time was on the Hamilton Tiger-Cats negotiation list. But Manziel had to fulfil certain requirements to join the league. The league's due diligence included an assessment by an independent expert on domestic violence and a head-to-head meeting between Manziel and Ambrosie. The move reunited Manziel with Als head coach Mike Sherman, who also recruited Johnny Football to Texas A&M. Acquired to be Montreal's No. 1 quarterback, the 26-year-old Texan was 2-6 as a starter, completing 106-of-165 passes (64.2 per cent) for 1,290 yards with five TDs and seven interceptions. "When we made the decision to make the trade for Mr. Manziel, we knew the risks that went with it," Reed told reporters in Montreal. "We took a chance, we took a risk, an educated risk and it didn't work out. "That's the situation. We have a stable plan that will allow our football team to advance." Manziel was due a $75,000 bonus March 1 and scheduled to earn a $202,000 base salary in 2019. Manziel's departure leaves Montreal with five quarterbacks on its roster (Vernon Adams Jr., Jeff Mathews, Antonio Pipkin, Matthew Shiltz and Canadian rookie Hugo Richard). Reed feels Montreal has its '19 starter in that group. The Alouettes have struggled, both at quarterback and on the field generally, since Hall of Famer Anthony Calvillo — now a coach at the University of Montreal — retired after the 2013 season. During Calvillo's tenure in Montreal (1998-13), the franchise appeared in eight Grey Cup games, winning three. Calvillo — the most prolific passer in pro football history — was instrumental in that success, being named a league all-star five times and capturing its outstanding player award on three occasions. Montreal hasn't won the Grey Cup since 2010 and was last in the CFL playoffs in 2014. "Our fans have been long suffering for a stable quarterback situation and a stable team and a franchise committed to stability," Reed said. "You have to go through the pain of the process of getting there. "This process took a while to be broken and get to a point where it was and it's going to take a while to get back to where we need to be." Manziel had been out of football until signing with Hamilton. Former Ticats head coach June Jones, who is now the team's offensive co-ordinator, once boldly gushed about Manziel's potential.